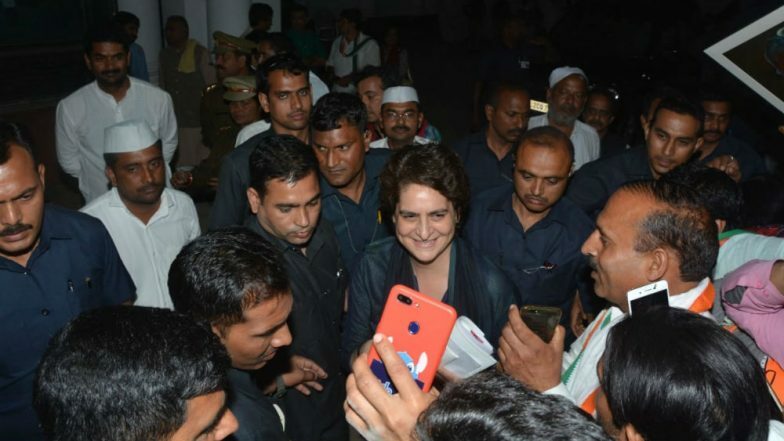 Varanasi, March 20: Congress General Secretary Priyanka Gandhi Vadra has reportedly dropped the plan of celebrating Holi at the party office in Varanasi. Instead of celebrating Holi with Congress workers, Priyanka Gandhi will meet the kin of martyred CRPF personnel in the Pulwama terror attack in Jammu and Kashmir. She is undertaking a three-day boat ride from Prayagraj in the Ganga. She will conclude her 'Ganga Yatra' today in Prime Minister Narendra Modi's Lok Sabha constituency Varanasi. In Varanasi, Priyanka Gandhi was supposed to celebrate the Holi festival at the Congress office in the city. However, the Congress in-charge of east Uttar Pradesh, cancelled the plan and has decided to meet families of CRPF jawans who lost their lives in the February 14 terror attack. She will also visit Kashi Vishwanath temple. After a visit to the temple, Priyanka Gandhi will arrive at Assi Ghat where she will interact with fishermen and women. Priyanka Gandhi Vadra Attacks Modi Government, Says 'What Happened In 70 Years Argument Has Expired, Now They Must Answer'. Before this, Priyanka will also visit the house of former Prime Minister Lal Bahadur Shastri in Ramnagar. Before kick-starting her election campaign in Uttar Pradesh, Priyanka Gandhi met the family members of Pulwama martyrs. Two CRPF personnel Ramesh Yadav of Varanasi district and Avdhesh Yadav of Chandauli district lost their lives in Pulwama terror attack. As many as 40 CRPF personnel were killed in the attack which was orchestrated by Pakistan-based terror outfit Jaish-e-Mohammed (JeM). On Tuesday, Union Home Minister Rajnath Singh also said he will not celebrate the festival of Holi this year in the wake of Pulwama terrorist attack. In retaliation to Pulwama attack, India launched a pre-emptive, anti-terror air strike on terror launch pads in Pakistan’s Balakot. Foreign Secretary Vijay Gokhale had said on February 26 that the airstrike resulted in the elimination of "a large number of terrorists".